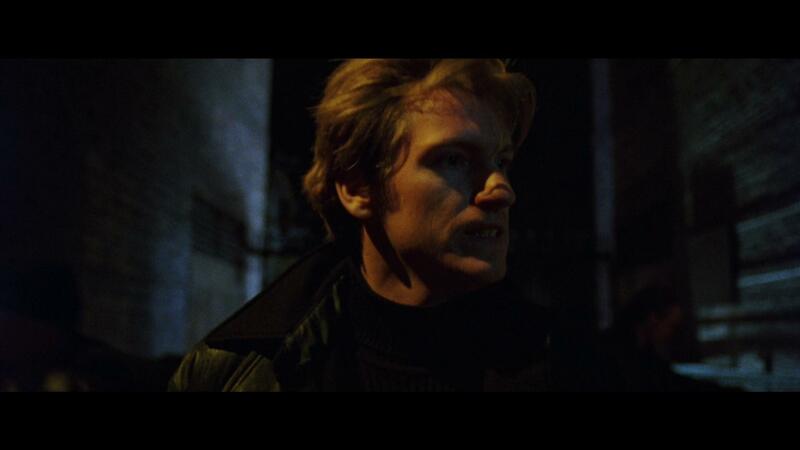 Judgment Night - Blu-ray Review - ReDVDit! Judgment Night is a 1993 American action thriller film that was directed by Stephen Hopkins and starring Emilio Estevez, Cuba Gooding Jr., Jeremy Piven, and Stephen Dorff as a group of friends that are on the run from a gang of drug dealers (led by Denis Leary) after they witness a murder. 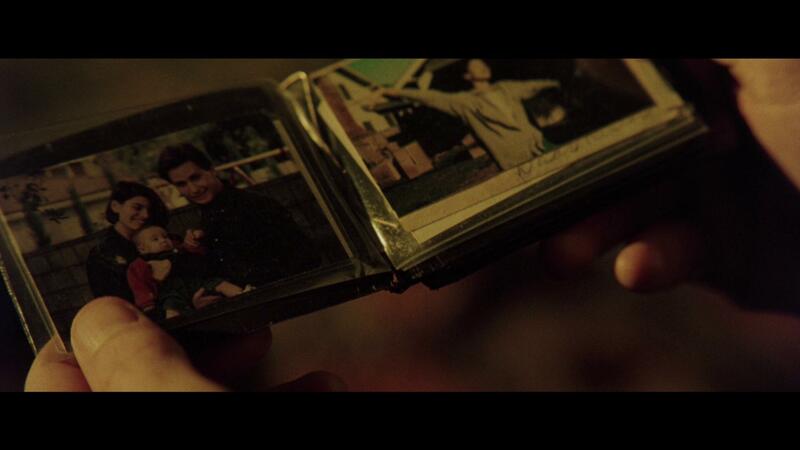 The film was originally released onto DVD on January 20, 2004. 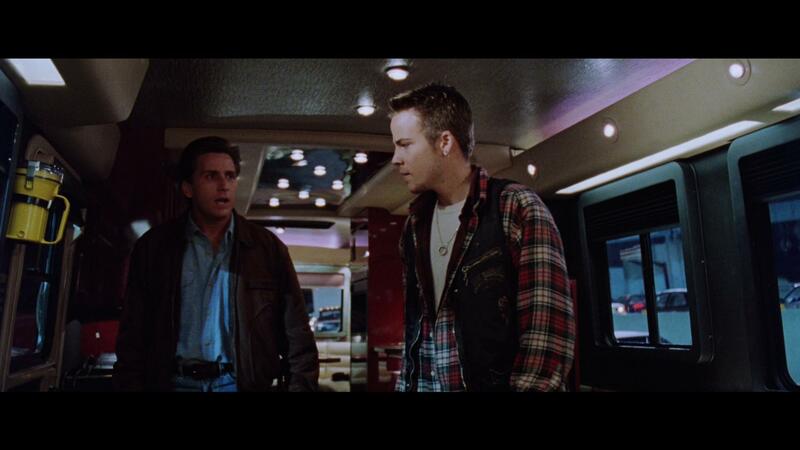 Starting off following Francis, Wyatt, along with his brother John and friend Mike Peterson as they are set out to go see a professional boxing match in Chicago with their friend Ray Cochran, who is testing out a lavish and expensive RV. 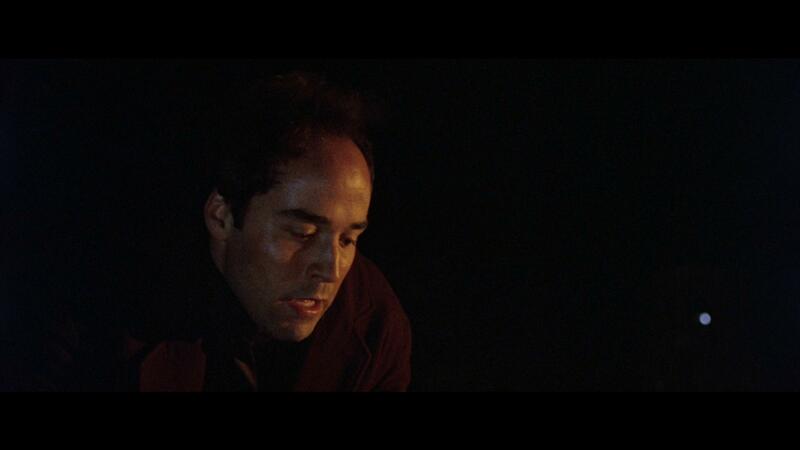 During the film’s production, comedian Adam Corolla was a stand-in for one of the “bad guy” actors as he was friends with the assistant director, allowing for this to be his first foray into film. The movie debuted at number five, and ended up grossing a total of just over $12 million at the US Box Office. According to the review aggregation website, Rotten Tomatoes, the film holds an overall approval rating of 33% based on the 18 reviews that have been submitted, with an average rating of 4.2/10. While audiences polled by CinemaScore gave the film an average grade of “B” on an A+ to F grading scale. Judgment Night is a movie, that while it’s a solid popcorn flick, really doesn’t offer a lot in terms of cinematic achievements, or anything that you could consider to make it an outstanding experience. The performances from the cast members were executed very well, and the story is enough to provide a believable experience that will really allow for an enjoyable experience for anyone that might have even an inkling of interest in seeing this group work together. Overall, I personally had fun with this movie as it was one that I’d never seen before, finding a few parts to be funny, and the overall feeling the story left me to be exactly what I expected it to do so considering the era in which it was released and the overall genre in which it lives in. This new release of Judgment Night from Warner Archive boasts a pretty solid visual presentation that offers a fresh taste of the storyline that was previously only made available on VHS and DVD. With a nicely done re-master of the visual presentation, we’re not only able to see everything as it’s happening, but this may offer some spectacles that would have previously not been seen. The colors within the release fall right in line with the era in which the movie came out, with it retaining a good portion of the natural grain of the film, and offering a presentation that is representing of the early 90s from beginning to end. 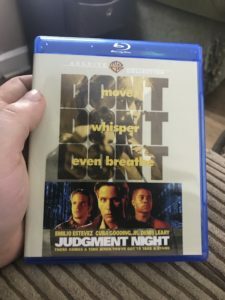 Packaged with an English DTS-HD Master Audio 5.1 mix, the Blu-ray release of Judgment Night offers an audio experience that obviously could have not been had with this movie until now. Boasting a significantly cleaner presentation over similar films of this time, the sound effects were really what grabbed my attention off and on as my wife and I watched along. The dialogue is spoken clearly, and while it doesn’t offer much in precedence over the other elements of the track, there wasn’t anything that had gotten in the way of the speaking parts, and everybody was able to be heard and understood without issue or any need to adjust the volume levels. The Blu-ray release of Judgment Night comes packaged in a single-disc Blu-ray amaray case. 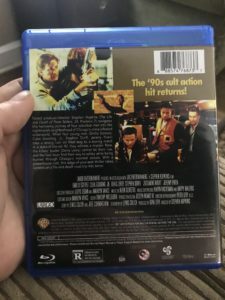 Within the case, the standard Blu-ray copy of the movie, featuring a piece of artwork that features the three main characters and is different from that of the case. There are no digital copies included nor are there any slipcovers included. 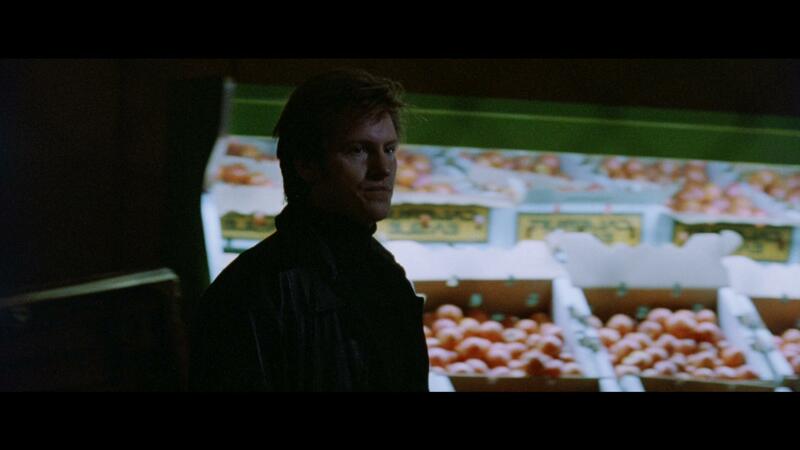 Unfortunately, there are no special features included on this Blu-ray release of Judgment Night. As a result, there is no rating on this section. Overall, my wife and I both had fun as we watched through this release of Judgment Night last night. 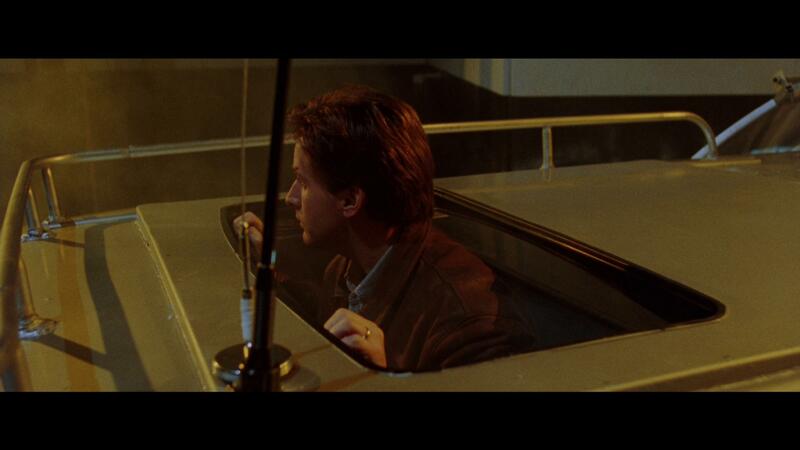 Sure, it’s not anything special in terms of cinematic achievements; but, the overall experience is something that is great and should be had by anyone who enjoys a good sit down with Emilio Estevez. The visual and audio presentation were handled really great with this release, and overall, it offers a stunning presentation for a film of this age. I do wish that there had been some special features included with this release, as I personally would have loved to have seen more; but, it is my understanding that releases like this often do not come with them, so I didn’t really expect there to be any. If you’re considering this release for your collection, I would absolutely recommend picking it up. Especially if you’re a fan of cheesy movies with Estevez, or any of the accompanying cast members. 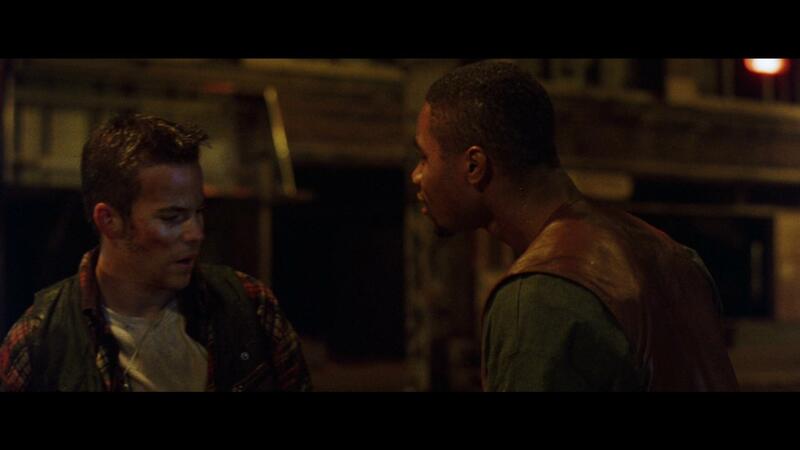 Judgment Night is available on Blu-ray today.